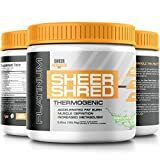 #1 Best Fat Burner For Men & Women - SHEER SHRED - Top-Rated Premium Thermogenic Supplement For Maximum Natural Weight Loss - Guaranteed Results or Your Money Back! 30 Servings (UPC 646437165679) is sold at the following online stores. We've find the latest prices so you can compare prices and save money when making your purchases online. Please click on the links below to browse to each store's webpage.